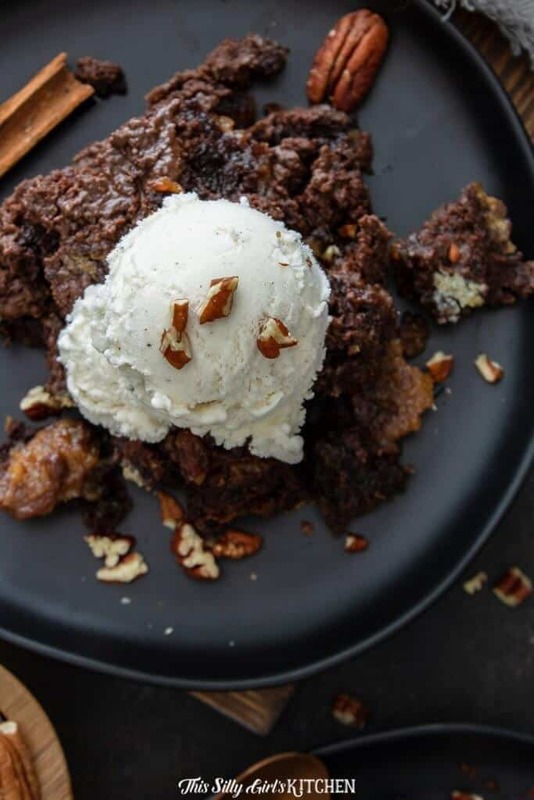 Chocolate Pecan Cobbler, an easy, decadent pecan cobbler recipe made with brownie mix! 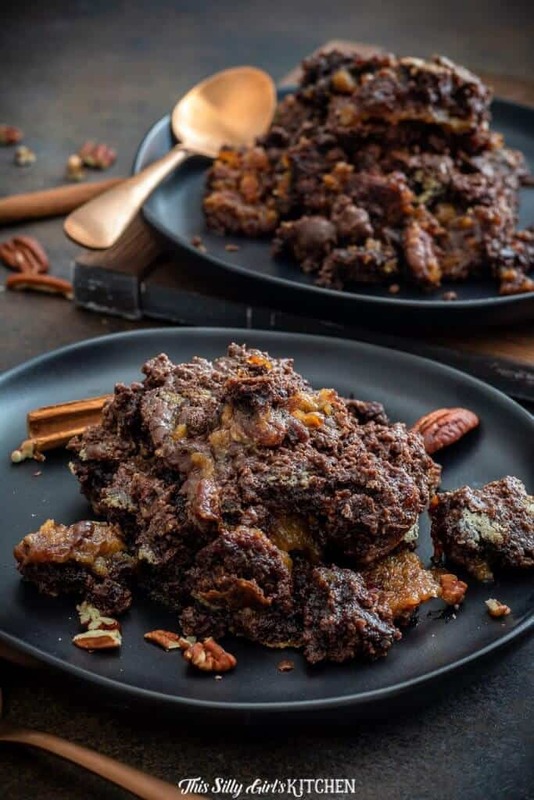 This is the perfect holiday or anytime dessert for pecan or chocolate lovers! 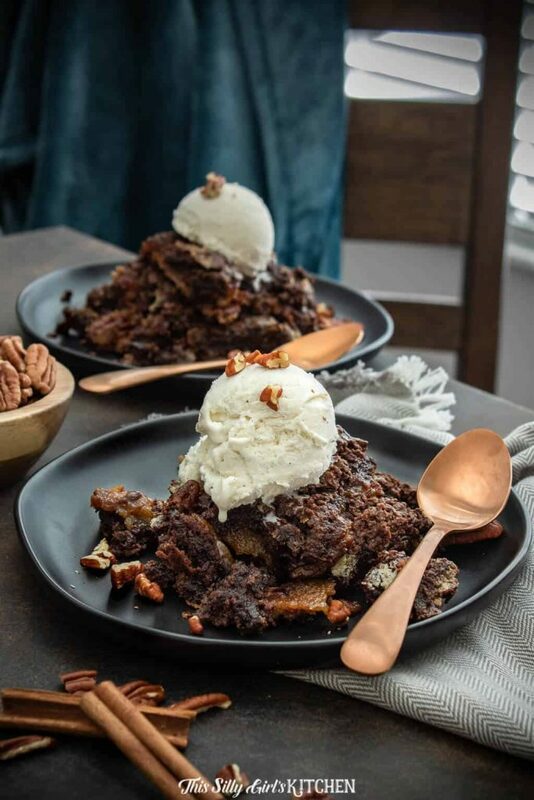 When I think of the holidays, I immediately am transported back into my Grandma’s kitchen and I know this pecan cobbler is a recipe she would love! This post is sponsored by BJ’s Wholesale Club, all opinions are 100% my own. 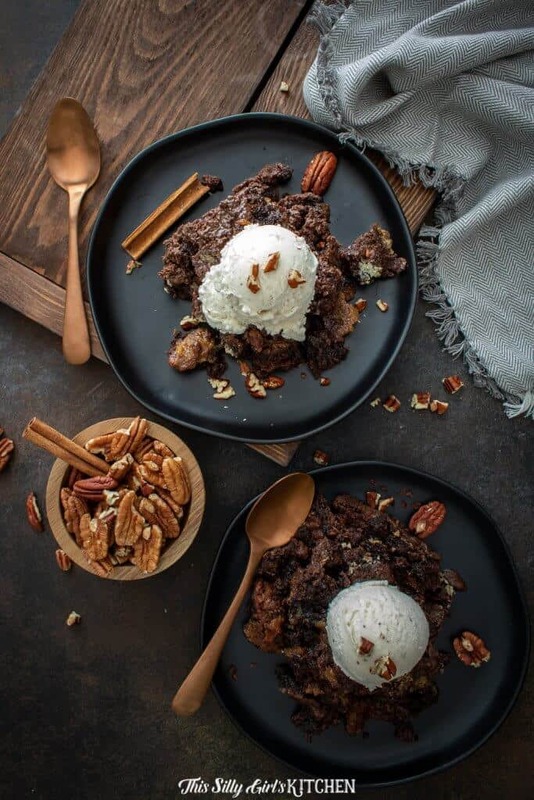 Being from the south, we are obsessed with pecans, especially during the holidays! 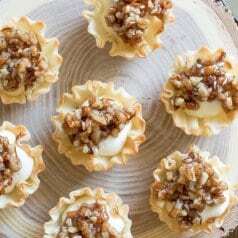 From classic pecan pie to roasted pecans and my Grandma’s specialty; pecan nut cups. I was already at BJ’s Wholesale Club shopping when that dessert bug just hit me. You know the one, that little sweet tooth came a-knocking! Now, yes, I could have picked up some additional goodies from the bakery area (I already grabbed a cookie platter – oops. ), but I really wanted something, warm and ooey gooey I could make at home. I immediately thought of this peach dump cake my Mom made last June that I just can’t stop thinking about. I wanted to recreate it with fall flavors – I immediately rushed to the baking aisle to see what I could come up with. Huge boxes of brownie mix? Yes, please! 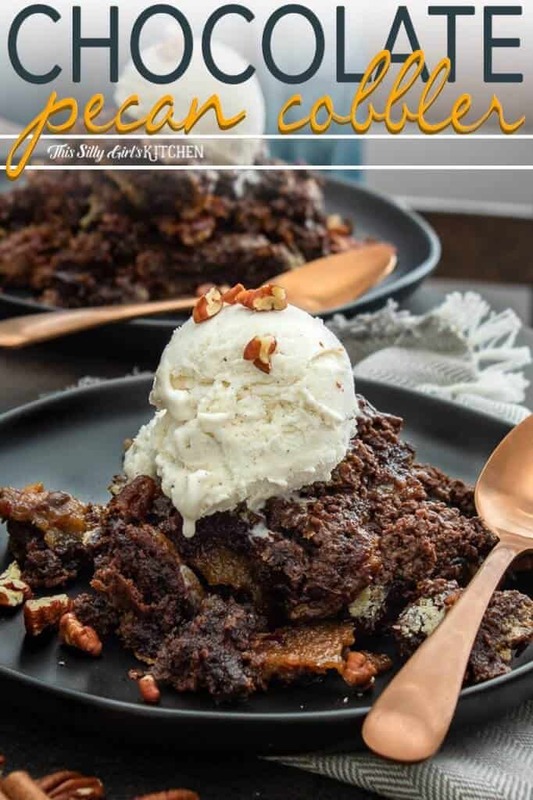 Right away I knew I wanted to make a pecan cobbler with it, so I grabbed a bag of Wellsley Farms pecans, and some other pantry staples I needed and I was good to go! Grease a 9×13 inch baking dish. Add pecans directly to the baking dish. 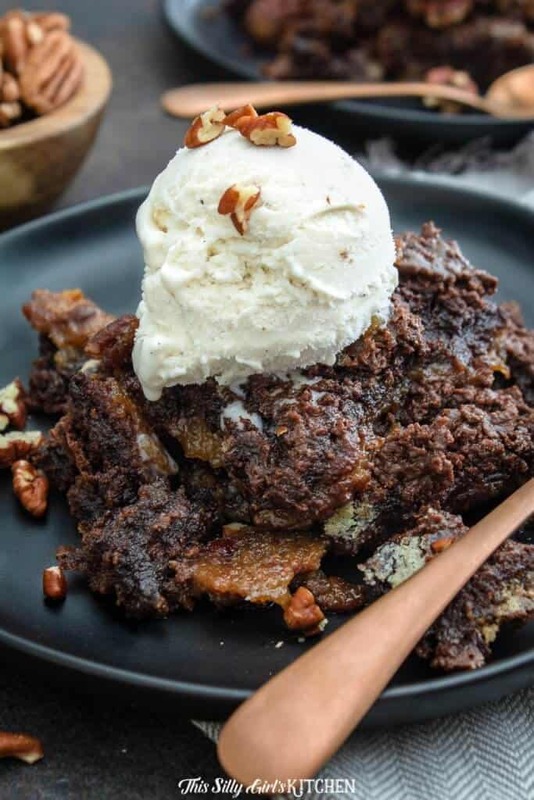 Make the ooey gooey pecan pie filling consisting of butter, flour, maple syrup, brown sugar, vanilla, cinnamon, and eggs. Pour over the pecans. Dump the brownie mix on top. Smooth it out evenly. Pour over the melted butter so all the brownie mix is moistened. Bake at 350° for 35-40 minutes until just slightly jiggly in the center. 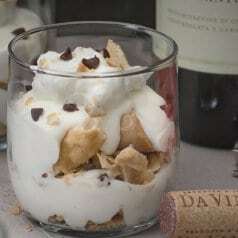 Let cool slightly, serve warm as is or with vanilla ice cream or whipped cream! 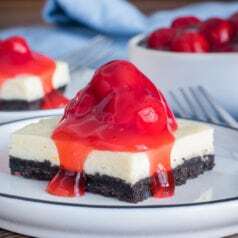 Hubba hubba, talk about one warm, comforting, fall dessert! 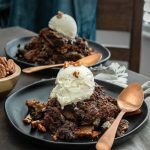 There is just something about pecans that I love to enjoy in the fall and winter, but this could definitely be made year-round too! To me, this is the perfect dessert paired with vanilla ice cream. I am a sucker for any warm dessert with melty ice cream on top, it just doesn’t get any better to me. Chocolate + pecans, what’s not to love?! If you love this flavor combo I highly suggest these chocolate maple pecan bars as well – WOW! If you are interested in becoming a member of BJ’s Wholesale Club like me, then just click on this link to register. Just for signing up you and I will both receive a $25 BJ’s gift card, score! Preheat oven to 350°, grease a 9x13 inch baking dish. Place pecans into the baking dish in a single layer and set aside. Place the butter into a small sauce pot over medium heat, let butter melt and start to bubble, about 2 minutes. Add the flour and whisk to combine, cook for 2 minutes, it will be a tan color. Slowly add in the water while whisking continuously, cook an additional 2 minutes. Continue to whisk so the bottom doesn't burn. Add the maple syrup, brown sugar, vanilla, cinnamon, and salt. Stir to combine until the brown sugar is melted, about 30 seconds. Take off the heat and let cool 5 minutes. Place the eggs in a medium-size bowl, add about 1 tablespoon of the syrup mixture into the eggs while whisking continuously, do this about 5 more times to temper in the eggs. Add the remaining syrup mixture and stir to combine. Pour everything over the pecans. Dump the brownie mix over the pecan filling, smooth it out into an even layer. Pour the cup of butter all over the top, make sure all of the brownie mix is moistened. Bake for 35-40 minutes, the center will be very slightly jiggly. Let cool 10-15 minutes and serve. I’m not really into cobbler, but this looks delicious. Thanks for sharing!